The 2.5 V8/V8-250 is a four-door saloon which was produced by The Daimler Company in the United Kingdom from 1962 to 1969. It was the first Daimler car to be based on a Jaguar platform, the first Daimler car with a unit body and the last Daimler car to feature a Daimler engine after the company was bought from the Birmingham Small Arms Company by Jaguar Cars in 1960. The engine is the hemispherical head V8 designed by Edward Turner and first used in the Daimler SP250 sports car. 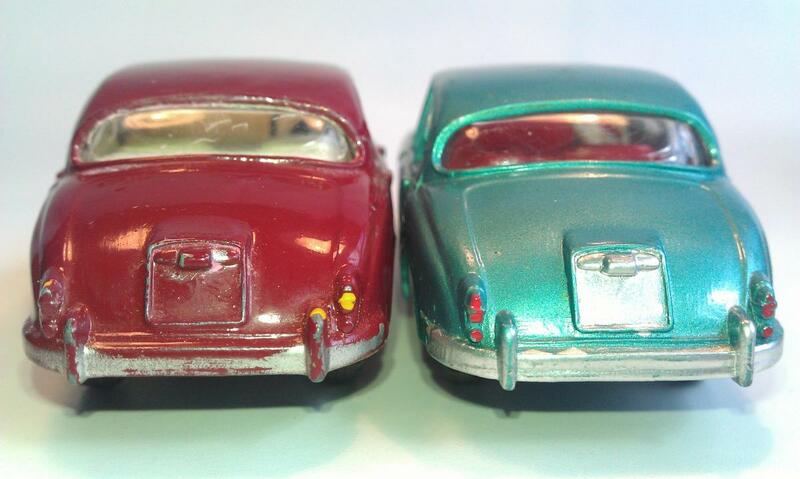 146 Daimler 2.5 V8 with box. Meccano Magazine January 1963 introduction 146 Daimler 2,5 Litre V8 by the Toyman. Model 146 Daimler is in fact an adapted model of 195 Jaguar 3.4 Litre saloon (1960-66). It has been given a new radiator grille, but the rest of the model is equal to the 195 Jaguar, with the exception of the base plate with a different model name. 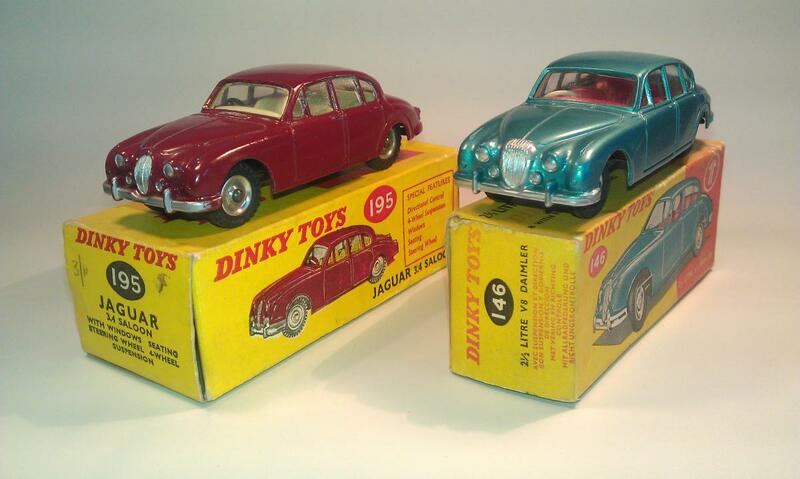 The Toyman in MM brags about the extra features of the Daimler, but they are exactly the same as the 195 Jaguar. Also "the new front seats of the splitbench type which can easily be converted to carry three abreast" of the 146 are equal to 195. Instead of a 3.4 litre engine of the Jaguar, it now has a 2.5 litre Daimler engine and the brand name has been changed from Jaguar to Daimler and got sales number 146. Remarkably, the patent number from 1959 of both models has remained the same (see picture), while the model, model number and brand name in 1963 has changed. Note: With the change from the brand name Massey-Harris to Massey-Ferguson later on, this went more difficult and there was a brand nameless period on the model in 1964 and 1965. Despite the brand name change, the tractor kept its own model number 300 in contrast to Daimler, which changed from 195 to 146. 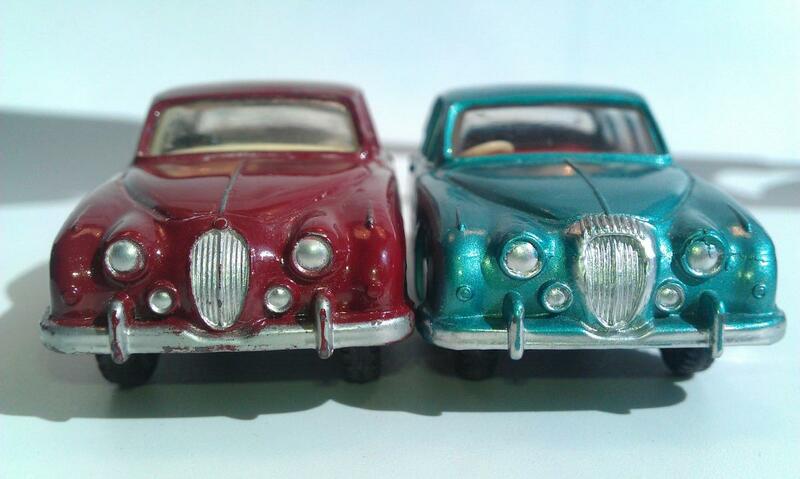 This will have to do with the fact that both 195 Jaguar and 146 Daimler were issued side by side from 1963-1965. 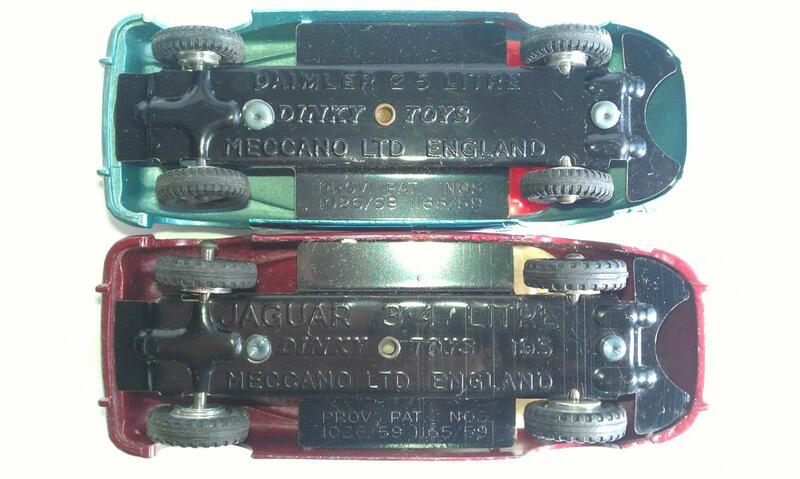 Daimler was incorporated into Jaguar in 1960. 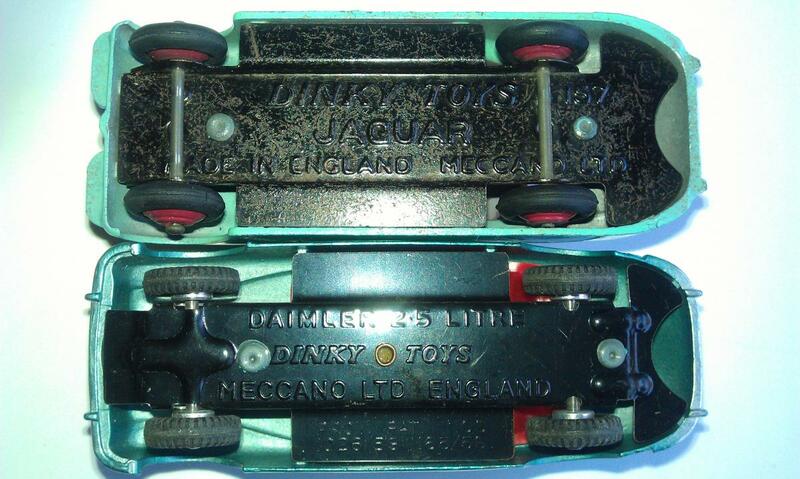 But I find it very remarkable that Meccano Liverpool did so much effort to produce both models side by side with so little difference for some years. 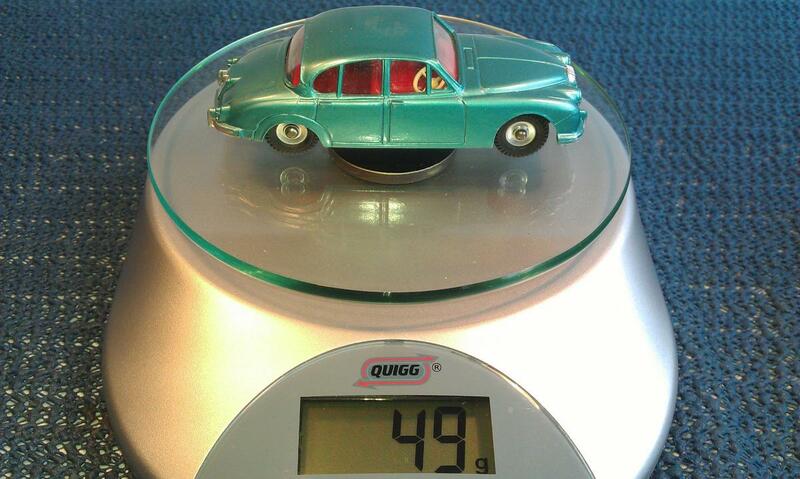 The weight of the 146 Daimler with 49 grams is slightly lower than the 195 Jaguar with 52 gram. 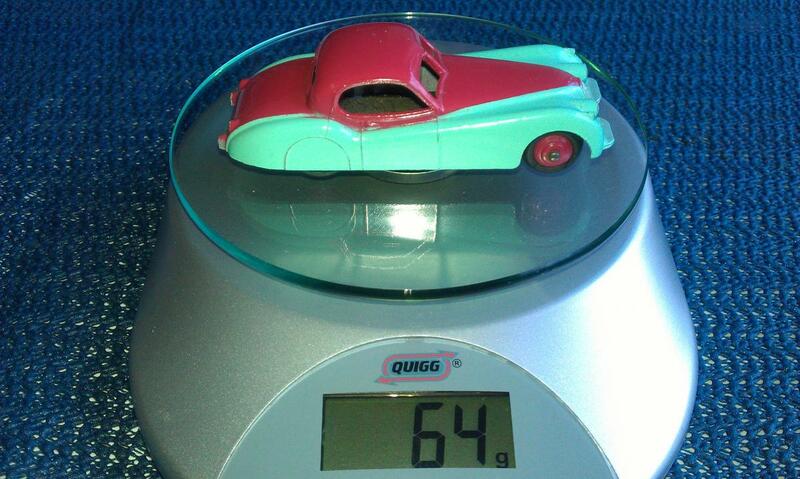 Because I thought that the weight of this 146 Daimler felt so light compared to the 157 Jaguar XK 120 coupé (1954-62) I weighed it and found 64 grams for the 157. 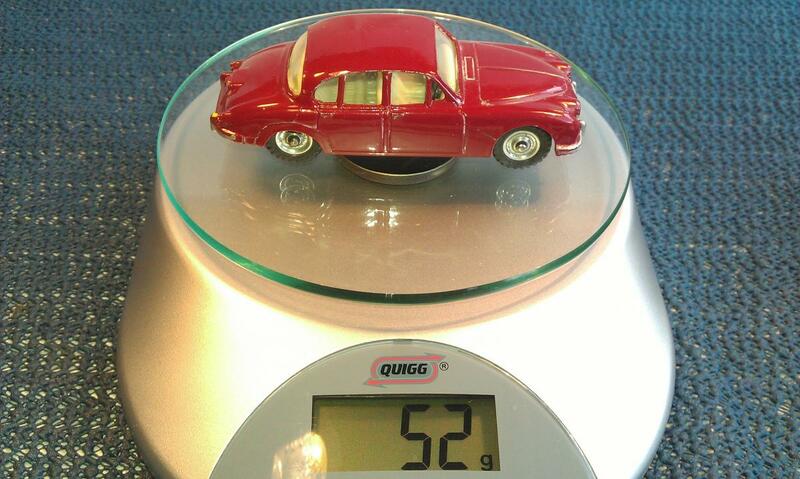 15 grams heavier than the 146 Daimler. When I started to turn the models around, I understood the cause of the difference in weight. 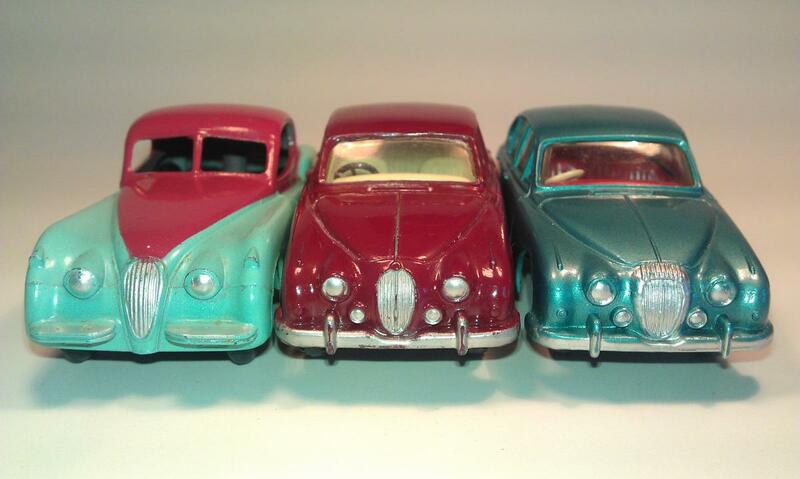 The metal wall of the Jaguar XK 120 body is visibly thicker than the metal wall of the Daimler. I show that with a photo of the bottom of both models side by side. Does this have to do with a new method of production with a different metal alloy (Maybe resin?) and application of the spark erosion technique, as Jacques explained? It's my invented theory but I hope on reactions about this. Jan Oldenhuis, 24 April 2018. An interesting comparison of these two very similar models. Another difference between them of course is the change to smaller wheels and tyres for the Daimler, also used on the 269 Jaguar Police Car. 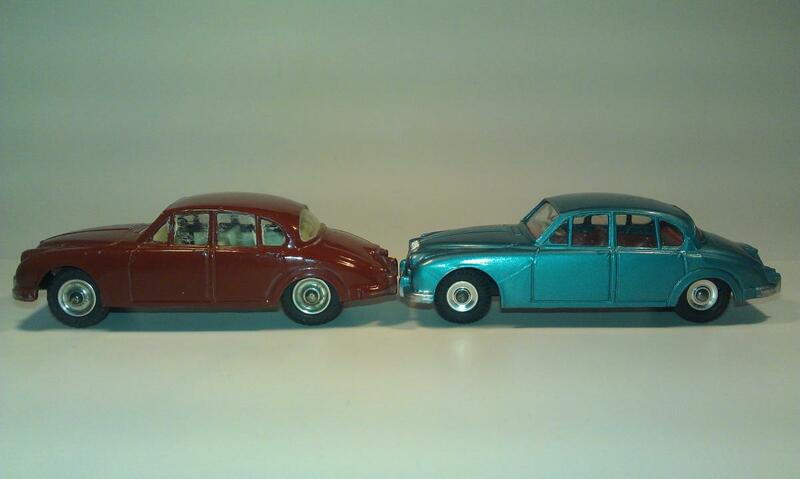 (Personally, I think this style of wheel spoiled the appearance of some of the Dinky models of larger cars of the period, such as the Jaguar Mk10, Mercedes Benz 220, Superior Ambulances and others). The patent numbers stamped on the base relate to the design of the toys' features such as the steering and suspension rather than the styling of the car, so would not need to change. Kevin, many thanks for your very welcome comment and your very informative explanation.